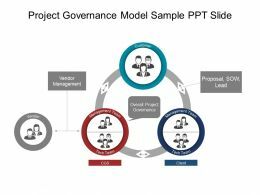 Presenting project governance model powerpoint slide graphics. 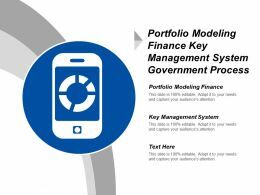 This is a project governance model powerpoint slide graphics. This is a six stage process. 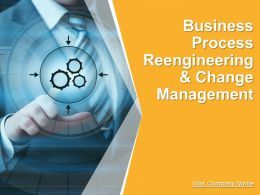 The stages in this process are project closure, project management cycle, project management, project governance, project phases. 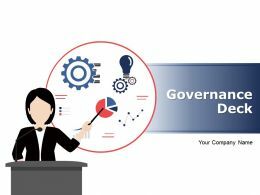 Presenting corporate governance and it governance model slide ppt example file. 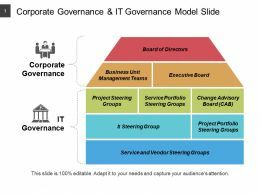 This is a corporate governance and it governance model slide ppt example file. This is a five stage process. The stages in this process are governance model, governance structure, project governance. 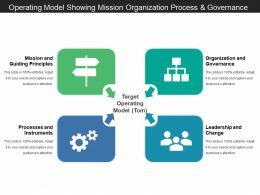 Presenting this set of slides with name - Operating Model Showing Mission Organization Process And Governance. This is a four stage process. 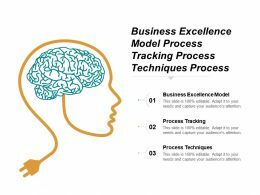 The stages in this process are Operating Model, Enterprise Architecture, Business Model. 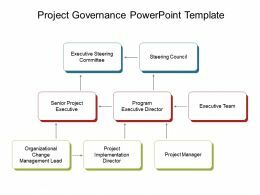 Presenting hierarchical governance structure powerpoint layout. 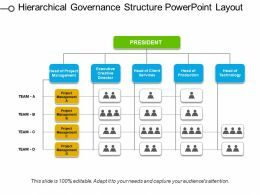 This is a hierarchical governance structure powerpoint layout. This is a three stage process. 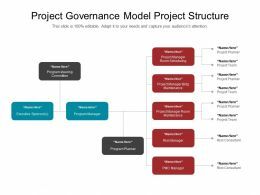 The stages in this process are governance structure, project governance, project structure. 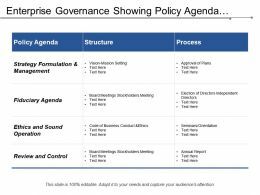 Presenting this set of slides with name - Enterprise Governance Showing Policy Agenda Structure Process. This is a two stage process. 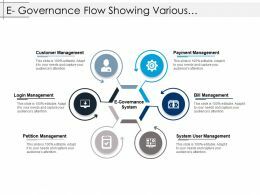 The stages in this process are Enterprise Governance, Business Governance, Company Governance. 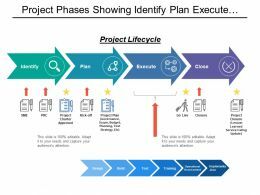 Presenting this set of slides with name - Project Phases Showing Identify Plan Execute Close With Project Charter Plan And Closure. This is a four stage process. 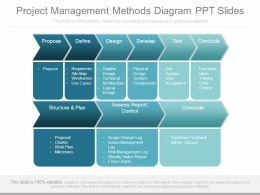 The stages in this process are Project Phases, Project Steps, Project Methods. 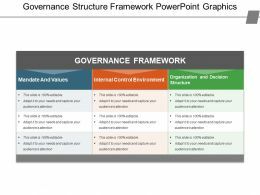 Presenting governance model example hierarchy chart slide ppt examples. 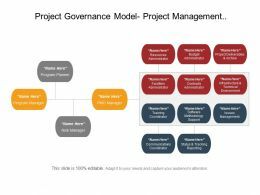 This is a governance model example hierarchy chart slide ppt examples. This is a five stage process. 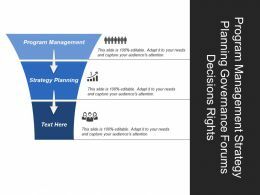 The stages in this process are governance model, governance structure, project governance. 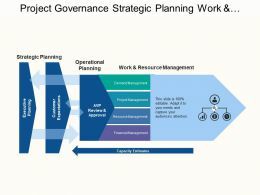 Presenting strategic governance model ppt slide. This is a strategic governance model ppt slide. This is a four stage process. The stages in this process are governance model, governance structure, project governance. 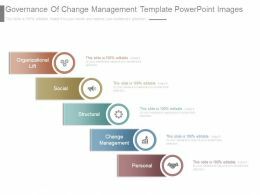 Presenting enterprise governance structure powerpoint templates. 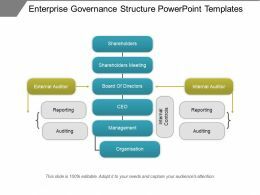 This is a enterprise governance structure powerpoint templates. This is a three stage process. 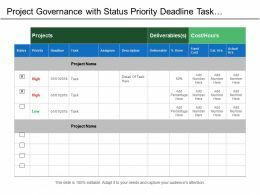 The stages in this process are governance structure, project governance, project structure. 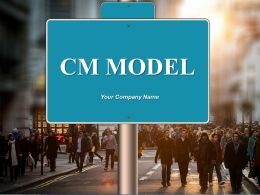 Presenting staffing organizations model template. 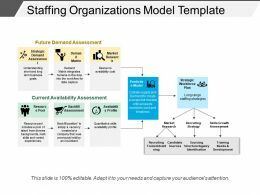 This is a staffing organizations model template. This is a five stage process. 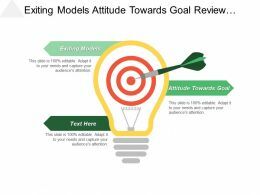 The stages in this process are staffing model, hiring model, recruitment framework. 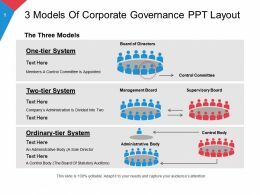 Presenting 3 models of corporate governance ppt layout. 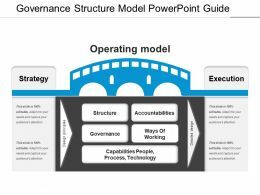 This is a 3 models of corporate governance ppt layout. This is a three stage process. The stages in this process are governance model, governance structure, project governance. 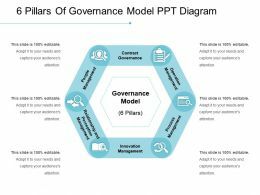 Presenting pillars of governance model ppt diagram. 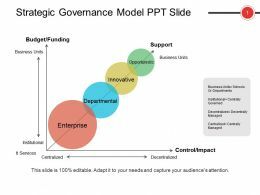 This is a pillars of governance model ppt diagram. This is a six stage process. The stages in this process are governance model, governance structure, project governance. 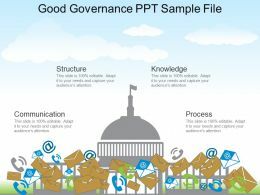 Presenting good governance ppt sample file. This is a good governance ppt sample file. This is a one stage process. 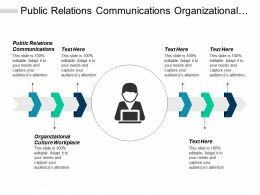 The stages in this process are communication, structure, knowledge, process. 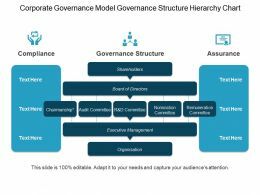 Presenting corporate governance model governance structure hierarchy chart ppt example. 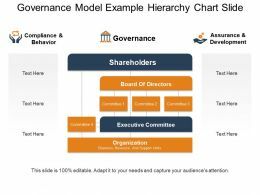 This is a corporate governance model governance structure hierarchy chart ppt example. This is a five stage process. The stages in this process are governance model, governance structure, project governance. 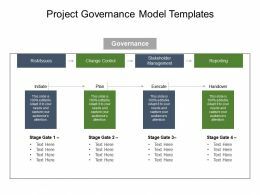 …project governance model templates powerpoint slide graphics. 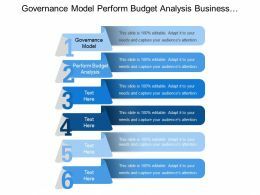 This is a project governance model templates powerpoint slide graphics. This is a four stage process. 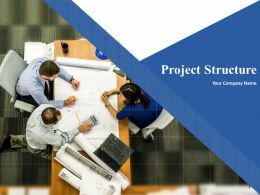 The stages in this process are project closure, project management cycle, project management, project governance, project phases. 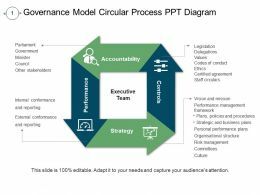 Presenting governance model circular process ppt diagram. 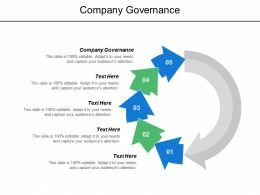 This is a governance model circular process ppt diagram. This is a four stage process. The stages in this process are governance model, governance structure, project governance. 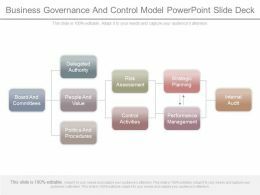 Presenting information technology governance model slide ppt images. 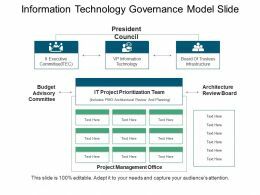 This is a information technology governance model slide ppt images. This is a three stage process. 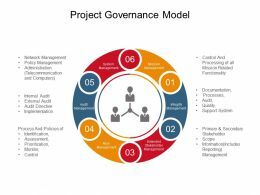 The stages in this process are governance model, governance structure, project governance. 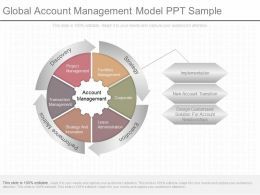 Presenting pptx performance management model presentation design. 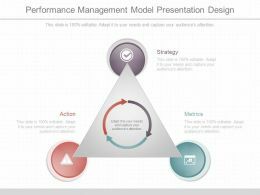 This is a performance management model presentation design. This is a three stage process. 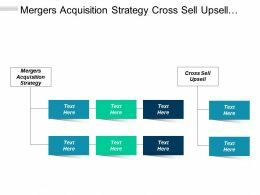 The stages in this process are strategy, metrics, action. 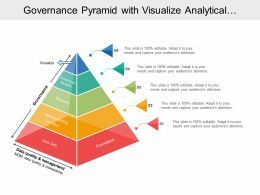 Presenting model of governance and security of big data diagram ppt presentations. 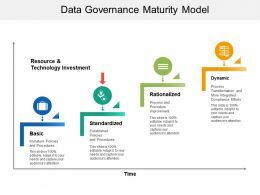 This is a model of governance and security of big data diagram ppt presentations. This is a three stage process. 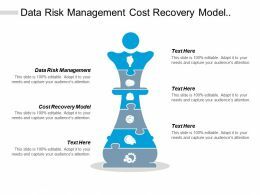 The stages in this process are confidentiality, integrity, availability, security model. 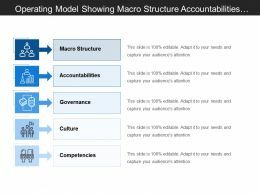 Presenting this set of slides with name - Operating Model Showing Macro Structure Accountabilities Governance And Culture. This is a five stage process. 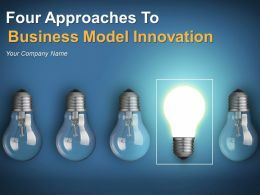 The stages in this process are Operating Model, Enterprise Architecture, Business Model. 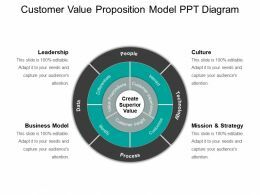 Presenting customer value proposition model ppt diagram. 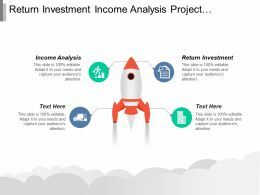 This is a customer value proposition model ppt diagram. This is a four stage process. 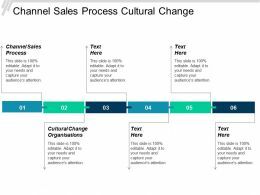 The stages in this process are customer value management, customer value proposition, crm, customer experience. 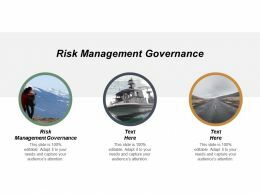 Presenting this set of slides with name - Project Governance Sponsor Steering Committee Management Office. This is a four stage process. 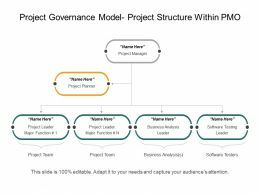 The stages in this process are Governance Structure, Project Governance, Project Structure. 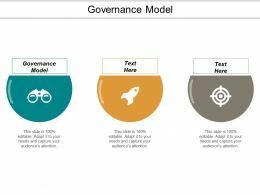 Presenting governance model framework presentation slide. 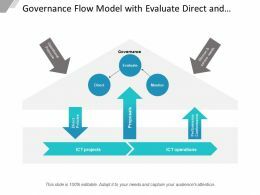 This is a governance model framework presentation slide. This is a eight stage process. The stages in this process are governance model, governance structure, project governance. 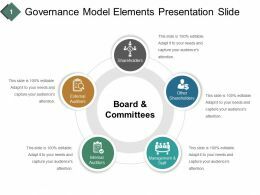 Presenting governance model elements presentation slide. 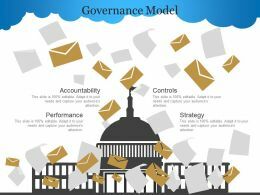 This is a governance model elements presentation slide. This is a five stage process. The stages in this process are governance model, governance structure, project governance. 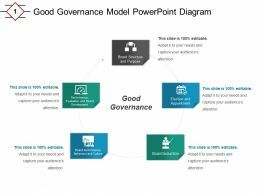 Presenting good governance model powerpoint diagram. 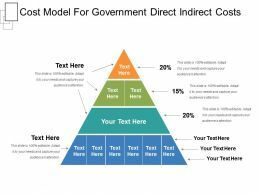 This is a good governance model powerpoint diagram. This is a five stage process. 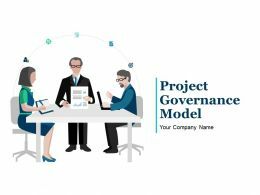 The stages in this process are governance model, governance structure, project governance. 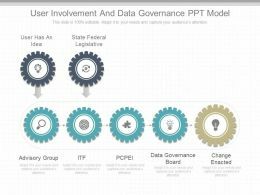 Presenting governance model ppt background designs. 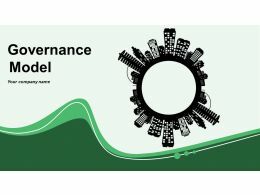 This is a governance model ppt background designs. This is a four stage process. 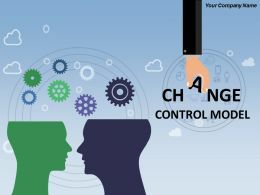 The stages in this process are accountability, controls, performance, strategy. 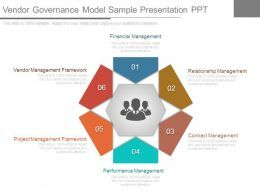 Presenting corporate governance model sample ppt example file. 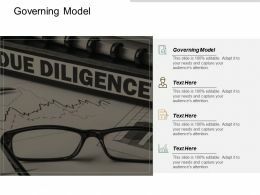 This is a corporate governance model sample ppt example file. This is a four stage process. 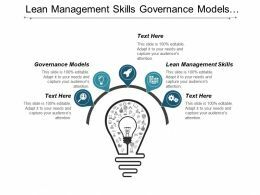 The stages in this process are overnance model, governance structure, project governance. 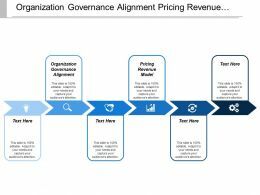 Presenting this set of slides with name - Target Operating Model Governance People Process. This is a four stage process. 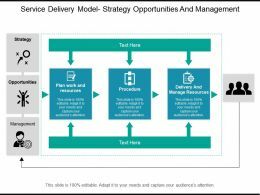 The stages in this process are Target Operating Model, Enterprise Architecture, Business Model. 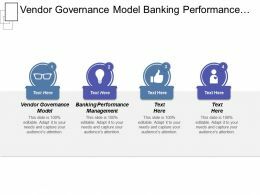 Presenting this set of slides with name - Governance Flow Model With Evaluate Direct And Monitor. This is a one stage process. The stages in this process are Governance Flow, Governance Structures, Governance Model. 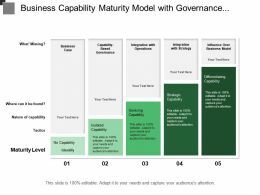 Presenting this set of slides with name - Business Capability Maturity Model With Governance Operations And Integration With Strategy. This is a five stage process. The stages in this process are Maturity Model, Cmm, Continous Improvement. 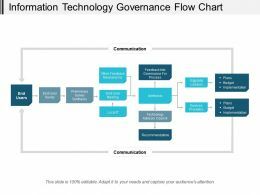 Presenting this set of slides with name - Information Technology Governance Flow Chart. This is a three stage process. The stages in this process are Governance Flow, Governance Structures, Governance Model. 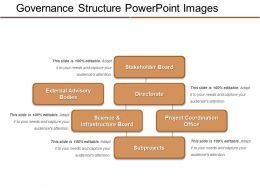 Presenting governance structure powerpoint images. This is a governance structure powerpoint images. This is a four stage process. 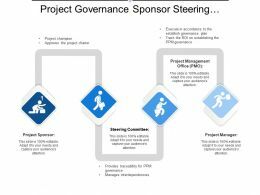 The stages in this process are governance structure, project governance, project structure. 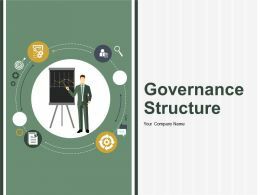 Presenting corporate governance structure hierarchy chart ppt examples. 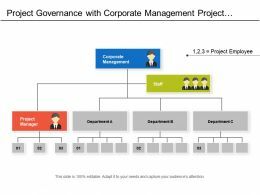 This is a corporate governance structure hierarchy chart ppt examples. This is a ten stage process. The stages in this process are governance model, governance structure, project governance. 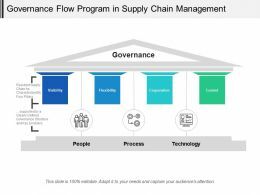 Presenting this set of slides with name - Governance Flow Program In Supply Chain Management. This is a four stage process. The stages in this process are Governance Flow, Governance Structures, Governance Model. 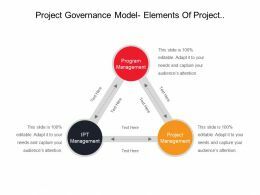 Presenting project governance ppt presentation examples. 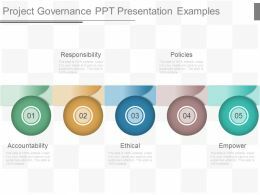 This is a project governance ppt presentation examples. This is a five stage process. The stages in this process are responsibility, policies, accountability, ethical, empower. 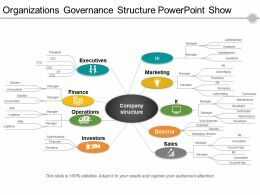 Presenting organizations governance structure powerpoint show. 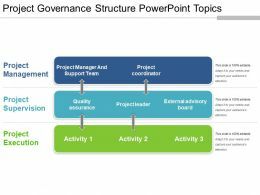 This is a organizations governance structure powerpoint show. This is a nine stage process. 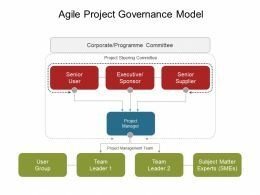 The stages in this process are governance structure, project governance, project structure. 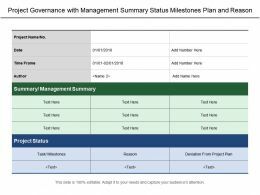 Presenting this set of slides with name - Project Governance With Management Summary Status Milestones Plan And Reason. This is a three stage process. The stages in this process are Governance Model, Project Approach, Project Management, Program Governance. 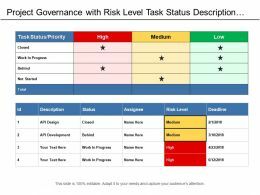 Presenting this set of slides with name - Project Governance With Risk Level Task Status Description And Deadline. This is a four stage process. The stages in this process are Governance Model, Project Approach, Project Management, Program Governance. 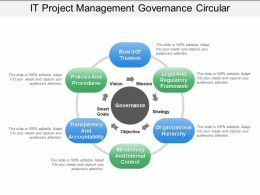 Presenting this set of slides with name - Project Governance With Corporate Management Project Manager And Departments. This is a four stage process. The stages in this process are Governance Model, Project Approach, Project Management, Program Governance. 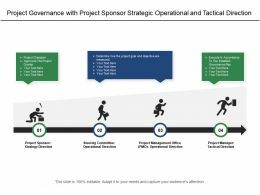 Presenting this set of slides with name - Project Governance With Project Sponsor Strategic Operational And Tactical Direction. This is a four stage process. 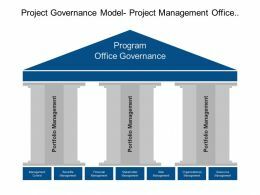 The stages in this process are Governance Model, Project Approach, Project Management, Program Governance.